Wednesday 21st March 2018, is yet another date fixed by the Nigerian Federal High Court, Abuja, presided over by Justice Binta Nyako, for the resumption of hearings on the long awaited trial of Biafran agitators who have been held in prison custody for close to three good calendar years now. The presiding judge bereft of any other option in the eyes of the law and principles of human rights, has no other option than to release Mazi Benjamin Mmadubugwu, Mazi David Nwawuisi and Mazi Chidiebere Onwudiwe on bail. To fully buttress this fact, there exists reasons why Justice Binta Nyako gets lawfully bound to dispense justice by releasing these men from extra-judicial incarceration on the next sitting. Placed on bail, the required physical presence of the concerned will be regularly made in court without any contravention. One of the very reasons why Mazi Benjamin Mmadubugwu and his co-detainees are most eligible for bail is premised on the fact that they have been remanded in prison custody by Justice Binta Nyako beyond even a jail term for the presumed crime of treasonable felony being accused of. The Nigerian government’s prosecutor has failed oftentimes to tender reasonable evidence indicting them before the court. This is basically against the Constitution of Nigeria and the Administration of Criminal Justice Act (ACJA). Therefore, the continued detention of these men is against the provision of the law and totally fashioned out to service the dictatorial and sadistic pleasure of the Nigerian government. Justice Binta Nyako must brace up against all odds by abdicating justice for these victims of oppression by getting them released. There exists a stipulation in all known laws of Nigeria that the accused presumably remains innocent until otherwise proven in any court of competent jurisdiction. However, the continued incarceration of these Biafran agitators in Kuje prison, purely negates the provision of the laws of the country and especially the Constitution which is supreme. In a situation where the innocence of these detainees have failed to be accorded due recognition, it then becomes incumbent upon Justice Binta Nyako as the presiding judge, to invoke the principles of the Constitution as provided, to the knowledge of humanity. The travesty of justice being meted out against these fellows over the years, has been concealed and no sane being will approve of this level of wickedness. It is on this background, that their rights to fair hearing and justice must be given premium attention. Justice Binta Nyako is therefore bound by law, to respect the rights of these men and accord them bail in their next appearances in the court. Another reason these detainees should be granted bail, arises from the enormous damages they possibly could demand from their captors should they eventually be found innocent of the registered accusations. 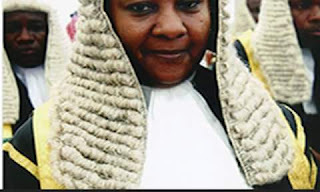 Does the presiding judge – Justice Binta Nyako, the National Judicial Commission (NJC) and the Nigerian government really understand the implications of extra-judicially detaining an accused person whose offence is bailable and who eventually gets vindicated? If these detainees fail to be granted bail on the ground of their presumed innocence, post-trial period will most definitely ensue when they will demand claims for the enormous damages incurred. Armed with these aforementioned reasons, Justice Binta Nyako most definitely, has no other justifiable option left for her than to order the immediate release of these oppressed innocent Biafran agitators held in Kuje prison, come 21st March, 2018.